You get a terrible headache. What do you do next? Take ibuprofen and try to sleep it off? Call your primary care physician (PCP) for an appointment? Dial 911 for an ambulance to take you to the Emergency Department (ED)? What if that headache comes with a cough and shaking chills? Would an ad influence your decision? 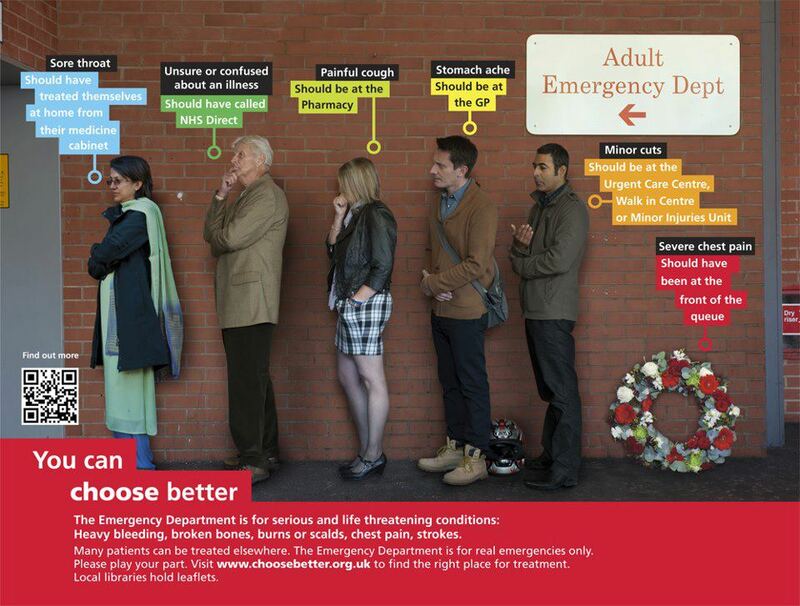 I came across this image on Facebook - part of a British campaign launched in late 2011 by the Leicester region of the National Health Service (NHS) in response to winter pressures on their Accident and Emergency units (A&Es, aka EDs). The campaign website lists the uses for various care options (Self-Care, Pharmacy, General Practitioner (aka PCP), Urgent Care Centre, Emergency Department & 999 (translation: 911)) and lets you download an iPhone or Android app to make the choice. As it turns out, similar campaigns were launched in other regions of the United Kingdom, spurred by a national policy mandate to reduce A&E traffic and and to treat patients in the appropriate medical settings - after all, mismatches cost patients time and money in addition to placing a larger financial burden on the health care system. One such effort in London even involved planting an NHS employee in front of the A&E to redirect patients with minor issues to the on-site primary care clinic. The ad struck me (and perhaps the 12,500 others who shared it on Facebook) for its uniquely British bluntness and the impression that, even beyond that bluntness, it would be hard to imagine it in the US. Why is it that we don't see similar campaigns here (beyond the challenge of laying out our fragmented health care options in a reasonable, app-friendly format)? After all, we struggle with the same issue of overcrowded Emergency Departments and wasted resources. In 2009, according to the most recent CDC data, Americans made 136 million visits to the ED. Only 12 percent of those visits were for immediate or emergent medical issues while 42 percent of them were considered urgent and 43 percent were semi- or non-urgent. In the US, we've found that access to primary care is a huge factor in Americans going to the emergency room for issues that could have been treated elsewhere, especially for minorities and for patients on Medicaid or without insurance. In one study, researchers asked 31 patients who'd come to the Emergency Department for a non-urgent medical issue why they’d done so: most said that they couldn't get an appointment with their PCP, that the PCP's office staff referred them to the ED, or that they thought it would be faster to go directly to the ED than to go (inevitably) via their PCP. These important challenges demand solutions like more urgent care and after hours clinics as well as easier access to PCPs. But there’s another factor that is oddly taboo in this discussion: the role that we play as patients (to the extent that we have control) in deciding where to seek care. When I shared the NHS ad on Facebook, my economist friend Willa Friedman emailed me with her (Very Economist) analysis: "So there are at least two explanations: (1) People think they’re special and then under-appreciate/under-change their behavior in response to the impact their actions have on others OR (2) People really have no idea about the options.” What I realized I liked about the ad is that it uses information and a touch of drama to address both factors and in doing so, puts some of the responsibility on patients. We talk a lot about patient or consumer-driven health care and, separately, about doctors' roles as stewards of health care resources without allying the two causes and recognizing the important role patients play in this stewardship (Lisa Rosenbaum has some great insights on this issue in her recent article). Instead, we have to ask and enable patients to work with doctors to use the health care system judiciously. That's why I think this ad is so powerful, and why we in the United States could stand to learn something from it.